Katrina, Priyanka, Deepika, Jacqueline, Anushka: Who Will Be Signed For Krrish 4? The universe is shaking. Wonder Woman is feeling threatened. Cat Woman is counting her nine lives and Amazon Woman has fled to the forests. Because another epic battle for the title of Supergirl has just begun. Given how well all the Hollywood Superhero ventures (Avengers, Superman, Batman, Captain America, etc) are doing even in the Hindi dubbed versions – some surpassing the collections of even the biggest of Hindi movie releases in the same week – Bollywood is gearing to up its superhero quotient. And also given that Hrithik Roshan’s Krrish franchise with his dad is India’s biggest success in the superhero stakes, it was a given that dad/ Producer/Director – Rakesh Roshan would make his fourth installment of Krrish a battle worthy of Universe. 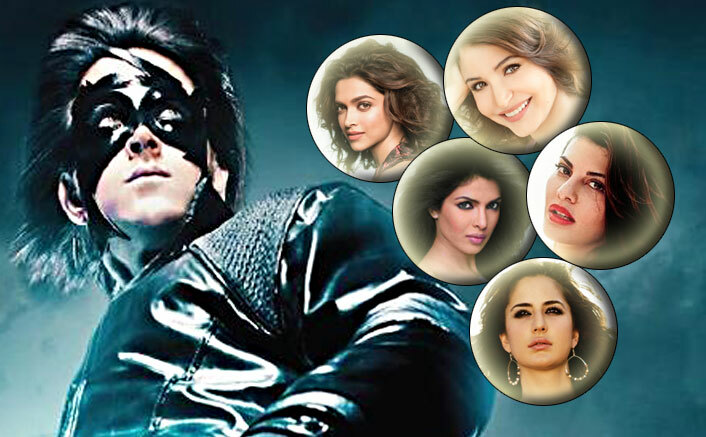 Katz, PC, Deepika, Jacqueline , Anushka Who will be the next Ms Krrish? “A superhero like Krissh needs a super heroine nothing less. No ordinary mortal. Someone who can fly, fight and save the world in one breath, figuratively speaking of course. And all our top rung actresses are more than super heroines. As to who it will be finally saving the world with Krissh? Wait and watch. That’s a secret for now,” says Rakesh Roshan. Announced for end 2018 or early 2019, Krissh 4 has already triggered a battle. And this time the weapons of war are lipsticks, mascara, eyelashes and powdered noses. Yes, the biggest of heroines are being shortlist to play Mrs Superhero. Names on the shortlist are Priyanka Chopra, Anushka Sharma, Katrina Kaif, Deepika Padukone and Jacqueline Fernandez. The top of the crop are already trying on the catsuits and colours that will match Krrish’s costume best. Speculation is rife that it’ll be one of these names. The heroines chose to stay mum, though the ‘crossed-fingers’ said it all. So who will it be? All are superhot and top of their game and match the studly Duggu to the T. But the decision this time is by Daddy-dearest who’s the captain of this starship enterprise. But watch this space for more on this. Meanwhile, the battle rages on! How To Make For Your Kid’s Birthday A Memorable One?